You may receive the above mentioned error messages due to following reasons. Some of the files used by Windows Media Player are missing or damaged. A codec that the media file needs is not installed. Your OS doesn’t have audio capability. Windows Media Player doesn’t support file format or the codec of the media file which you are trying to play. The correct audio device driver is disabled or not installed. You are using both Windows 2000 Terminal and Windows NT (this configuration has no audio abilities). To resolve this issue, you must follow the methods below in the order as they are listed. Test each method to determine whether it has resolved the issue. Note: Windows Media Player doesn’t support every media player. However, it doesn’t support the most common types of media files. Therefore, make sure that your media player supports the file type. If it is not supported, then don’t use any of the methods mentioned after method 1. If the Windows Media player doesn’t support the file format which you are using, then contact the file’s distributer of the file for info about what viewer supports that particular file type. Method 1: Make sure that Windows Media Player supports the file format you are using. Moving Pictures Experts Group extensions: .m1v, .mp2, .mp3, .m3u,.mpeg, .mp2v, .mpg, .mpa, .mpe, .mpv2. Unix File name extensions: .au, .snd. Apple QuickTime, Macintosh AIFF Resource File name extensions:.aiff, .mov, .qt, .aif, .aifc. In Windows Media Player, find a file that uses the same file extension when you receive the error message. If the other files play without any issues, then original file that you are attempting to play may be corrupted. If you get an error message when you play each of the files, then continue to the next method. Remove Windows Media Player from your system, restart the system and then reinstall it. Make sure that you are reinstalling the latest version of the Windows Media Player. This software is capable of resolving Windows Media Player Invalid File Format Error message and restore deleted, lost and corrupted videos, photos. It can easily recover JPG, TIFF, JPEG, GIF, BMP, etc. files and fix Windows Media Player Invalid File Format Error with ease. With the help of this software, you can recover data from hard drive on Windows 10, Windows 7, Windows 8, etc. Demo version provides with the preview of the deleted and corrupted photos or videos. Users have to avail full version of the software in order to recover lost or deleted files and overcome Windows Media Player Invalid File Format Error message. 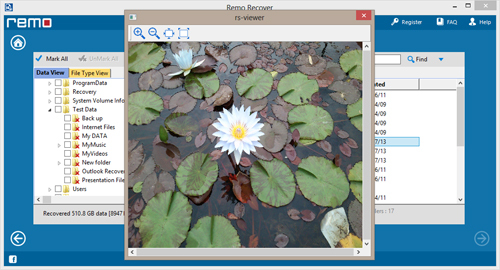 Using this software, you can also recover deleted files from Windows Media Player. 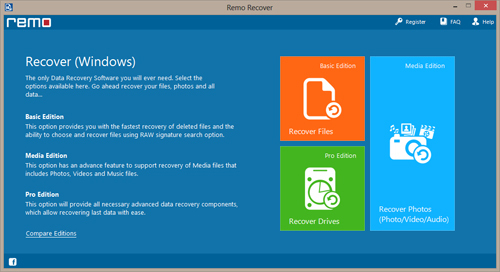 Step 1: Download and install Recover Media Files software . 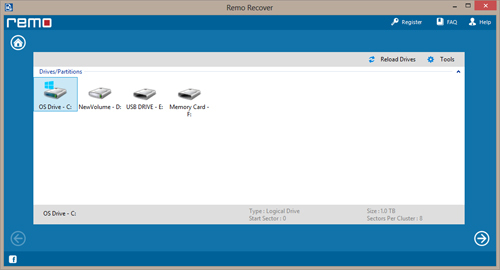 After installing, launch the utility and select ”Recover Drives" option from the main screen to recover data from Windows Media Player. Step 2: After that you will find list of logical Drives. Select the drive from where you need to recover data and click on “Next” button. Step 3: Once the recovery process is over, you can preview the retrieved files in "File Type View" and "Data Type View".